So we’ve been road-tripping quite a bit these past few weeks. I am overfreakinjoyed to report that we had a completely successful family vacation a few weeks ago! Whoopedydooooooo!! Or maybe after the last two family vacations ended in massive amounts of shukes, I should be saying Whoopedy-NO-dooooooo! Third time was definitely a charm. 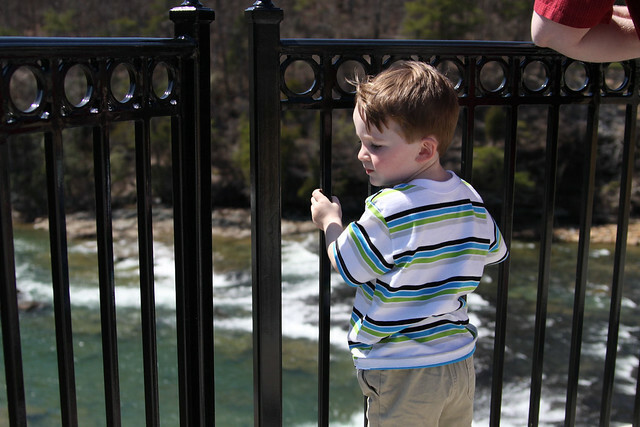 We took Garrett to Chattanooga, Tennessee over the last weekend of Spring Break. It was such a wildly fun trip that I got a little snap-happy and took approximately a quadzillion pictures. I should know better than to take so many photos of any event because it’s overwhelming after the fact. I get back home and start to hyperventilate when I see how many pictures are waiting to be sorted and edited and blogged about. 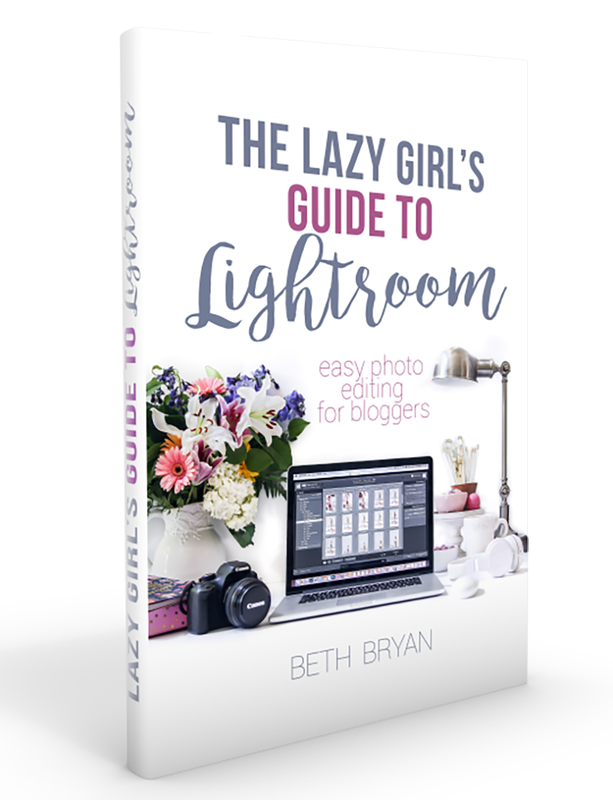 So instead of sorting and editing and blogging all those photos I tend to crawl into a hidey-hole, squeeze my eyes shut, stick my fingers in my ears and hum “lalalalalala” while simultaneously shoveling Oreos down my gullet. So… this is me venturing out of my hidey hole to document our recent family fun times and all the other events of the past few weeks. My flickr stream is about to burst from all the unviewed photos. 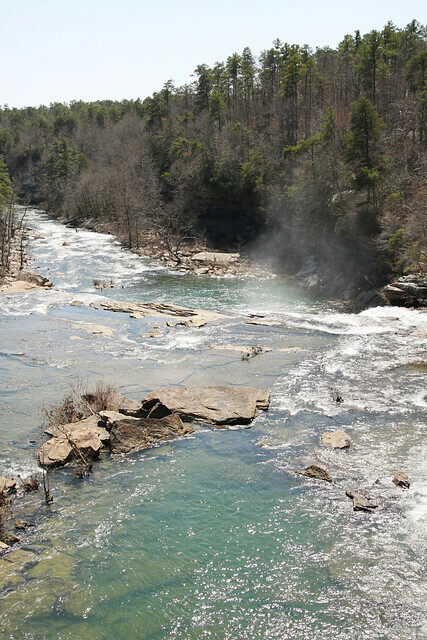 On the way up to Chattanooga from Birmingham we decided to take a little detour to see Little River Falls at the mouth of Little River Canyon. And I might have just broken the record for the number of times I have said the word “little” in one sentence. 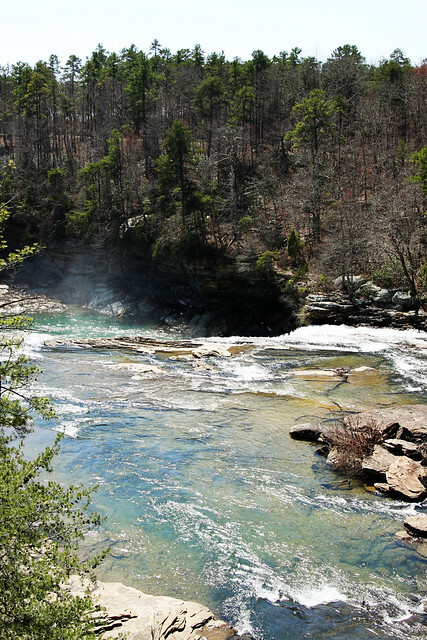 Little River Canyon is just outside of Fort Payne, Alabama near the stomping grounds of Randy Owen and crew. You or your trusty GPS can find it on the map, I’m sure. It’s a roadside waterfall, so you’ll know it when you see it. Can’t really miss it. 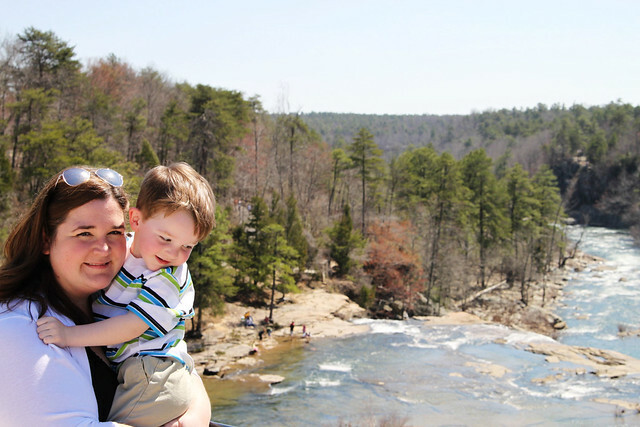 If you’re southern born and southern bred you should add Little River Canyon to your little list of places to see. It’s super easy to find and once you arrive it’s so accessible and beautiful you’ll wonder why you didn’t visit sooner. 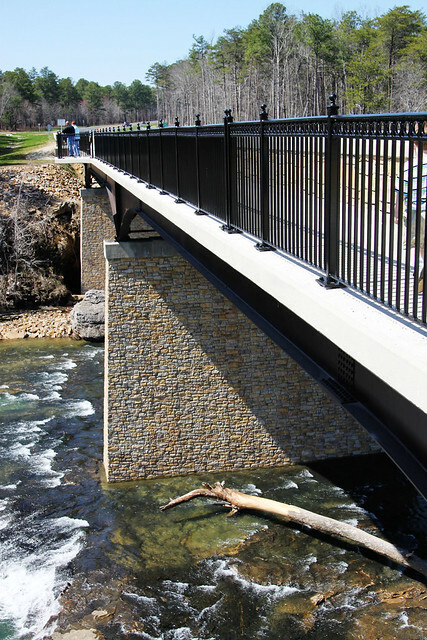 There was a nice new bridge over the water that gave super easy access to view the top of the falls. We strolled along and the snap-happiness began. Garrett was amazed by all the water and the noise. 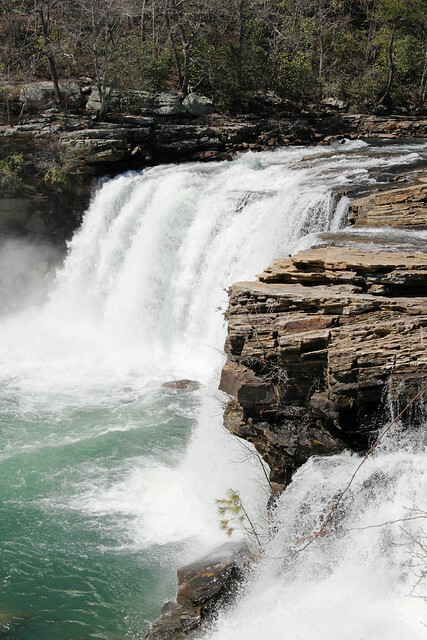 Little River Falls is supposed to be Alabama’s strongest waterfall, and it roars like lion. It was loud! G wasn’t too sure about the height when I lifted him up to get a better view and take a photo with me. I think he felt safer when he was behind the bars. 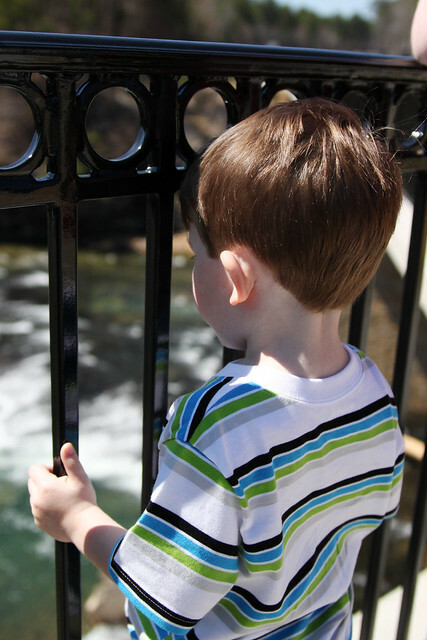 You couldn’t see much of the actual waterfall from the bridge, but you did get to see the rapids and see a little of the splash at the drop-off of the falls. It was so pretty and relaxing. I wanted to sit and just watch the water rush past. 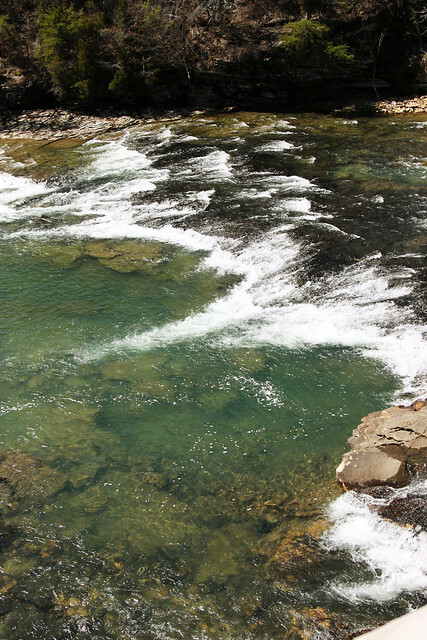 In order to see the actual falls you’ll have to hike down to the bottom to get a better look. 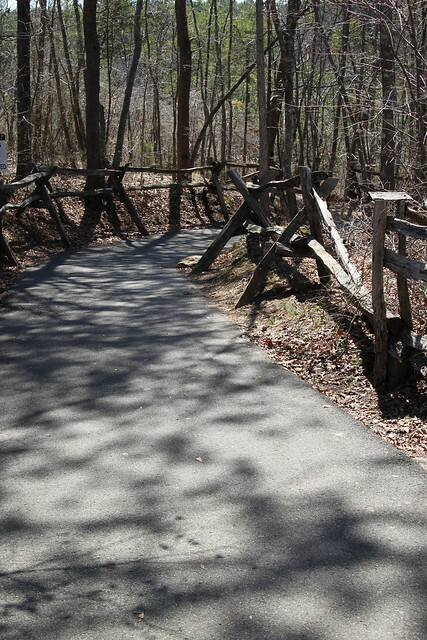 There was a nice paved path to get down to the base of the water fall. It was steep, but it was not an ankle breaker like some trails to waterfalls I’ve been on in the past. The good news is that it wasn’t a far piece down there. And once you got down there the view was just AMAZING! 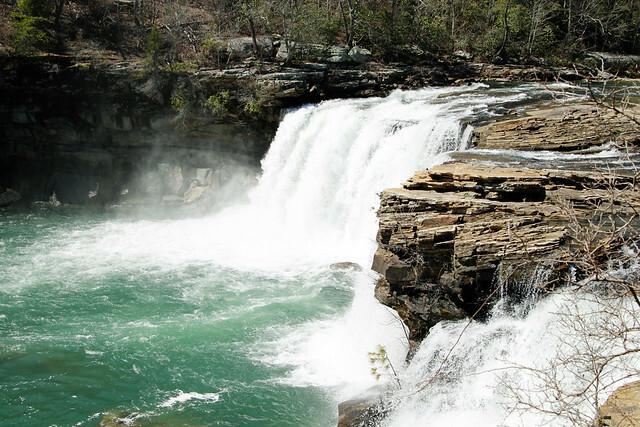 Little River Falls is just another reason why I love living in Alabama. I know we often get the short end of the stick when it comes to reputations. But what we lack in educational funding and proper nutrition Mother Nature makes up for in waterfalls, mountains and sugar-sand beaches. So from somewhere high on Lookout Mountain I’ll just smile with pride and say that my home’s in Alabama. No matter where I lay my head. « It’s time for the 2nd edition of the Garden Party! What beautiful scenery you had on your trip! Thanks for visiting my blog. Nice to meet you! I’m coming out of hiding to say that this Oregon girl LOVED Alabama! My boyfriend was working outside of Birmingham and I flew out there for the 4th of July. Well… flew to Houston and got stuck due to weather and ended up driving with a car full of strangers the rest of the way… but that’s a whole nother story 🙂 ANYWAYS… I loved the couple days we spent in Birmingham. It’s too bad he wasn’t just a little further northeast and we could have seen these waterfalls too! Wow Beth!!! Those photos are beautiful! 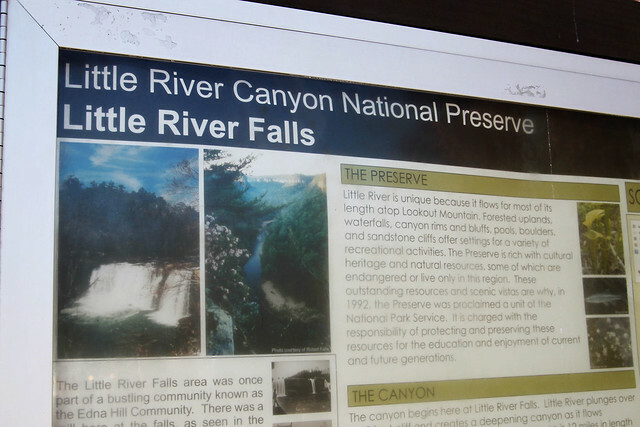 I am putting Little River Falls on my bucket list of places I need to visit. 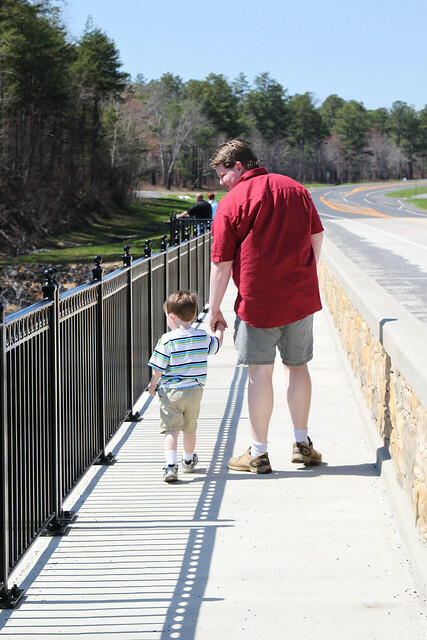 Your blog made me a little teary eyed and proud to be an Alabamian. Very pretty, thanks for sharing hope you share more of the south with us, who are from the west.